Attribution of authors: Attribution protects the integrity of an original work, and provides credit and recognition for authors. A license may therefore require attribution of the author or authors, provided such attribution does not impede normal use of the work. For example, it would not be acceptable for the license to require a significantly more cumbersome method of attribution when a modified version of the licensed text is distributed. Transmission of freedoms: The license may include a clause, often called copyleft or share-alike, which ensures that derivative works themselves remain free works. To this effect, it can for example require that all derivative works are made available under the same free license as the original. Protection of freedoms: The license may include clauses that strive to further ensure that the work is a free work, notably by enforcing some of the conditions specified in the paragraphs below: for example, access to source code, or prohibition of technical measures restricting essential freedoms. This paradox has been rolling around in the back of my head / subconscious for months now, but something about reading this section in this context crystalized the problem in my tiny brain: how can a community so focused on freedom approve of any restrictions? Specifically, when expressing concern about restrictions making it difficult to reuse works, how can this community approve of the copyleft or share-alike concept? The biggest legal problem facing the open educational movement is license incompatibility, as I discussed recently. For example, the millions of articles in Wikipedia and the 1.6 million media files in the Wikimedia Commons cannot be remixed with the thousands of courses and tens of thousands of media files coming from university OCW projects around the world. Why not? Because the “copyleft” scheme of the GFDL says that all derivative works must be licensed with the GFDL, and the “copyleft” scheme of the CC By-NC-SA license says that all derivative works must be licensed with the CC By-NC-SA. Hence, these materials cannot be remixed. It should be quite obvious that the sole culprit preventing this reuse and remixing is the copyleft restriction that is so happily permitted under the FreedomDefined definition of “free” (as well as the Free Software and many other definitions). For example, copyleft (very simply stated) is the rule that when redistributing the program, you cannot add restrictions to deny other people the central freedoms. You may copy and distribute a Modified Version of the Document under the conditions of sections 2 and 3 above, provided that you release the Modified Version under precisely this License. You may Distribute or Publicly Perform an Adaptation only under: (i) the terms of this License; (ii) a later version of this License with the same License Elements as this License; (iii) a Creative Commons jurisdiction license (either this or a later license version) that contains the same License Elements as this License (e.g., Attribution-NonCommercial-ShareAlike 3.0 US) (“Applicable License”). Why, when we are so worried about preserving freedoms, do we prohibit choice on the part of downstream users as to how they can license derivatives works they make? Why don’t we want to protect that user’s freedom to choose how to license his derivative work, into which he put substantial effort? The copyleft approach of both the Free Software Foundation and Creative Commons makes creators of derivative works second-class citizens. And these are the people we claim to be primarily interested in empowering. I can’t stress this point enough: the ShareAlike clause of the CC licenses and the CopyLeft tack of the GFDL rob derivers of the basic freedom to choose which license they will apply to their derived work. ShareAlike and CopyLeft privilege creators while directing derivers to the back of the bus. The following image shows which CC licenses are compatible with one another; in other words, it shows what content can be legally remixed with what other content. 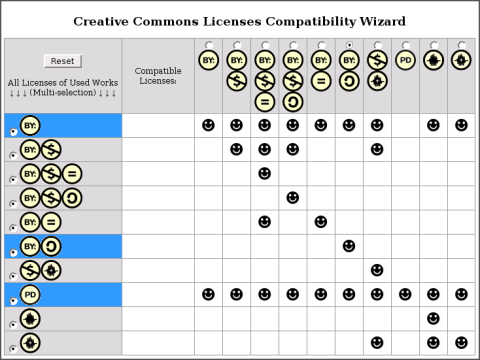 You should next notice in the CC compatibility graphic that there is only one license that is compatible for cross-license remixing with all Creative Commons licenses (and with the GFDL, although the graphic doesn’t show it): the Public Domain license. Technically, this isn’t a license – it is a dedication of copyrights to the public domain. It is a formal rejection of all restrictions, and a complete freeing and opening of content. It is the ultimate expression of the ideals of openness and freedom. So why do we settle for only four freedoms? Why isn’t our goal to have all OERs eventually exist in the public domain? If we really care about ease of reuse, if we really respect creators of derivative works, and if we really want to see the open education movement succeed, we should have the public domain as our final goal. Now, DON’T MISUNDERSTAND. I’m not saying that everyone who isn’t using a public domain dedication as of 5:00p tonight is an evil loser. I’m still very much a believer in and respecter of a step-by-step path into full participation in the open education community of practice. However, once upon a time I believed that the end legal goal of the progression was a license of some sort. Now I believe that the real legal end goal for open educational resources should be dedication to the public domain. So the obvious question, then, is when will Mr. Big Talker’s (my) courses on USU OCW be placed in the public domain? Very soon now. More about that in another post. The fundamental dilemma, in my view, is that some uses of a work essentially destroy the openness of the work. Joining something from the public domain, for example, to some original work, can have the effect of privatizing (or ‘enclosing’) the public domain work. You ask, how can we have restrictions in our licenses if we believe our content should be completely open? The answer is, we believe in restricting the applying of restrictions. The debate has its analogies. If you support democracy, what do you do when someone uses democracy to campaign for something that is not a democracy? The question of using one’s freedom of speech to argue for intolerance has been an issue from the first days of freedom of speech. Your response is to say, essentially, that democracy means allowing anyone to say anything, to campaign for anything, even if it involves the election of a government that destroys the democracy. I am not so sanguine. Er, what Stephen said. The idea of copyleft/SA is not to restrict those who would remix in good faith, but to prevent profit-taking landgrabbers from removing things from the commons. I take your point, though, that perhaps downstream users might be given more freedom to choose licences. I think the current language reflects legal reality, in that if you are not THAT specific about permissible licenses, someone will quickly find a loophole through which to drag your hard work into a commercial dead-end. The idea of copyleft/SA is not to restrict those who would remix in good faith, but to prevent profit-taking landgrabbers from removing things from the commons. No. Those “profit-taking landgrabbers” that copyleft (GPL, SA, and the like) licenses are aimed at cannot remove anything from the commons. All they can do is extend something without giving their extensions to the commons. The original material remains available to all. The whole point of copyleft licenses is to restrict the freedom of those who would add to or modify the material. (That’s not to say that this is wrong; I’m not making a value judgement here but just stating a fact.) It’s effective enough at this that I, as an open source software author, put under GPL things I may want to commercially exploit later and use the MIT license (or just go straight PD) on things I want to be free for anybody to use any way they want. Since the application of a more restrictive license on a derivative does not retroactively apply to the original, I’m not sure this analogy applies quite the same way. It would be more like someone exploiting the rights and practices of a free society to go someplace and create a more restrictive society within it… and it seems to me more repressive “mini-societies” exist all over the place within Canada and other countries that think they are free societies. Of course, whether collectives should be allowed to override individual rights (say, equality of women) is an ongoing argument, at least in western democratic countries. How about multi-licensing? If I were to publish everything I make in GFDL, CC-BY-SA, and let’s say Apache and GPLv3 just to round out the mix, then anyone can choose which of these licenses (yes, any or all of them) to use when distributing his derived works. But yes, I share your pain. In building LeMill, an educational resource sharing and remixing site, we’ve had to lock all content into one single license (CC-BY-SA) because allowing several licenses would make the remixing job a legal license hell. I think Stephen’s democracy analogy is so brilliant that I do not have much to add, except my standard answer: to protect freedom for all you need restrictions. “Share alike” is such a restriction. Also such things as arms laws and the idea of universal right to education are “restrictions” protecting freedom for all. Thanks for this analysis. I finally finished reading it and it presents an important perspective on the SA element and CC licenses as a whole (my main focus at the moment). For the guy who asked about the collective’s rights overriding the individual’s rights, I think that such an analogy doesn’t include the other gorilla in the room: that of the corporate owners of media that can’t be redistributed, recommercialized or remixed by anyone without the express permission, blessing and license (all of which require monetary payment) of the content owner. They hold the greater share of media repositories and the greater amount of resources to create more media (compared to the copyleft media commons), and none of it is legally granted to the paying users of their material – just “rented”. I don’t think that the GFDL restricts one from including derivatives similarly-licensed media whose licenses don’t provide any further restrictions on usage than what the GFDL allows, provided that a clear distinction can be recognized between the origins of either component in the same meedia. The CC-by-ND, I have no idea about if it has such compatibility with non-conflicting permissive licenses. For the record, the Wikimedia Commons, unless it previously did when you wrote this, doesn’t allow for media that restricts commercial or derivative uses to be submitted. So no CC-by-ND or CC-by-NC stuff is uploaded or present on there. Previous post: iPhone + Aggregator = iGag!